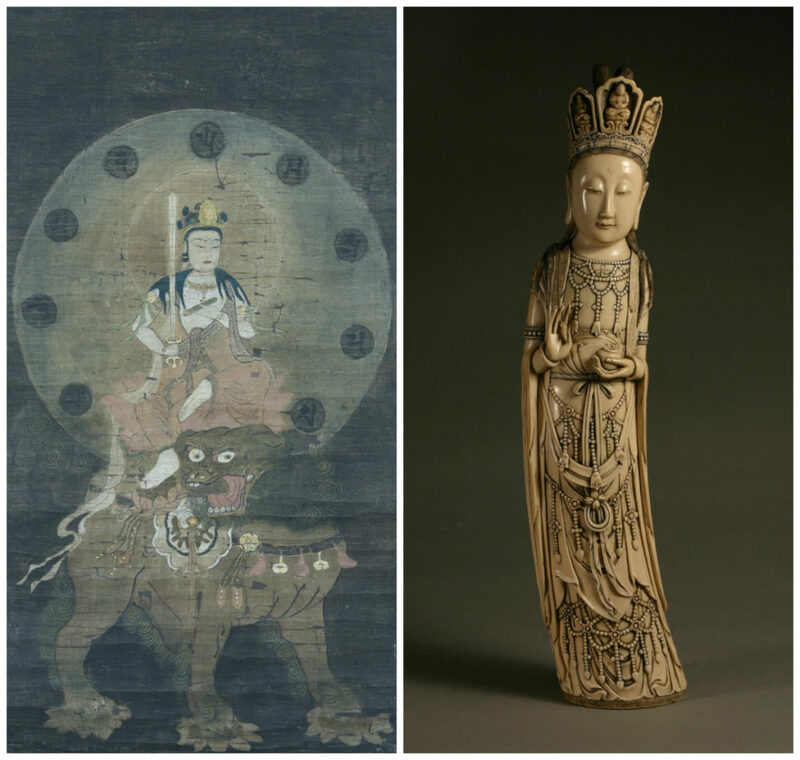 In preparation of a future exhibition on Buddhism and contemporary art practices at the AGGV, this issue’s Art Terms post will focus on terms and names associated with this ancient system of beliefs. Buddhism has evolved since its origin in India, taking on new iconography and meanings as the religion spread across Asia. Asana is a word that is heard with frequency in yoga classes. It refers to a stylised pose in Buddhist iconography. Buddhas and Buddhist figures are shown in a variety of asanas – seated, standing or reclining – with hands and other parts of the body in symbolic gestures known as the mudra. The symbolism of each figure is distinguished by a combination of the asana, the mudra, as well as physical characteristics such as elongated ears, the gaze of the eyes. 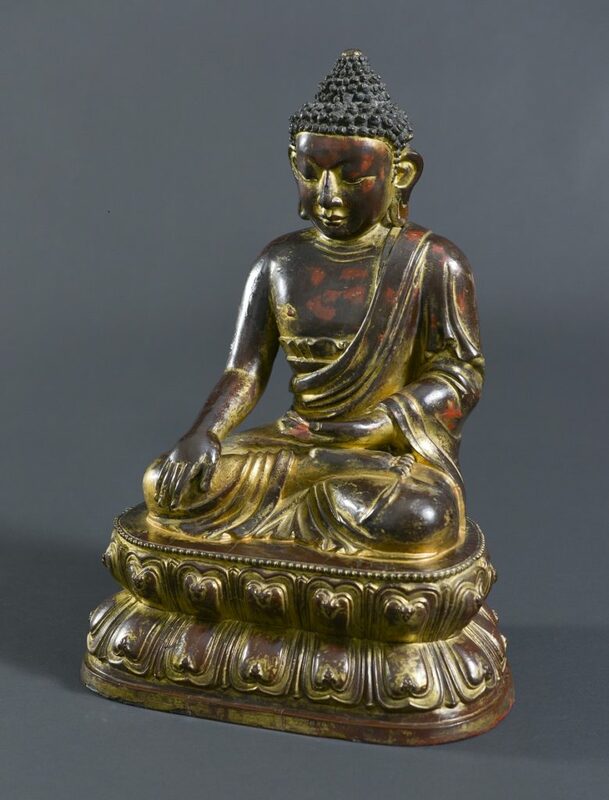 The gilded Tibetan Buddha above in the AGGV collection is depicted in serene contemplation, seated on a lotus throne with the right hand in the “calling earth to witness” mudra, signifying his enlightenment at Bodhgaya. From the Sanskrit, referring to a person who is on the path to attaining enlightenment and is destined to Buddhahood. The term is found in the Mahayana Sutras as practiced in North India, the Himalayas, Central and East Asia. There are numerous Bodhisattvas depicted in Buddhist art and literature, differentiated by the levels of spiritual realization that lead eventually to becoming a Buddha. Depicted above are two Bodhisattva titles. On the left is Manjusri, the Bodhisattva of Wisdom; and on the right is Guanyin or Goddess of Mercy as is known in China. 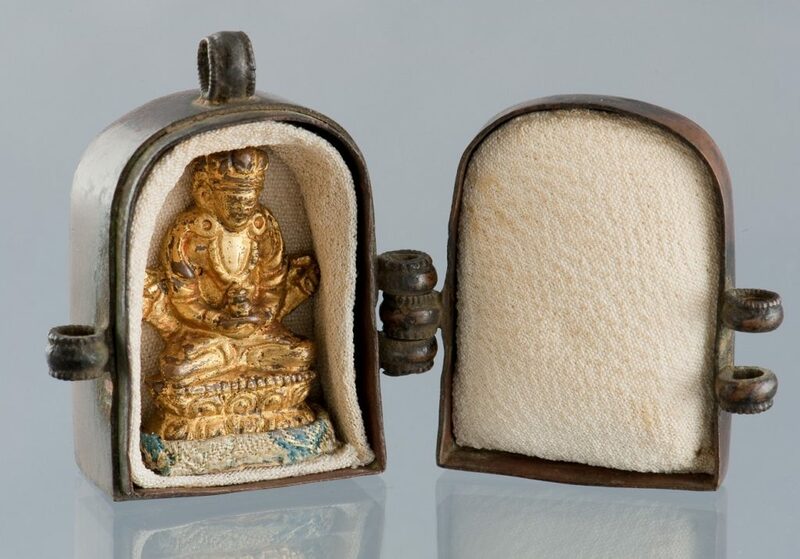 Known as a gau, this diminutive shrine measures only 4.8 cm. high and would have been carried by an itinerant monk or a travelling pilgrim. The loop at the top of the shrine suggests it be worn as a pendant necklace. The Buddhist statuette contained within offered the wearer protection during the journey. From the Sanskrit meaning “heap”, the stupa is a Buddhist architectural term referring to a structure that is hemispherical. Used as a place for meditation or for containing commemorative relics, its origin derives from pre-Buddhist mounds in India. 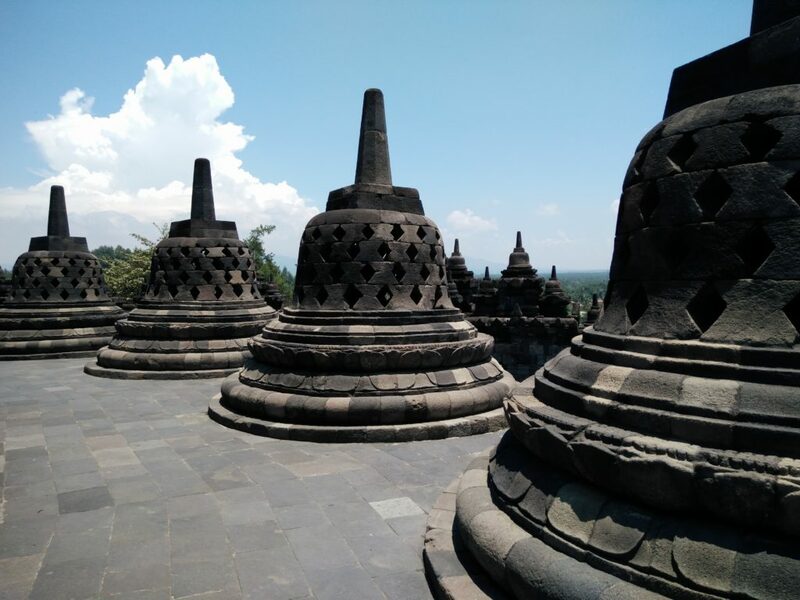 This form spread throughout the Buddhist world, taking on regional variations such as the pagoda form in China and Japan, or the terraced temple setting of Borobudur in Java, Indonesia, as seen in the image above. In every case, the stupa is free-standing so that pilgrims may walk around it as part of the worship ritual.